Roberta DePiero was born in Cleveland, Ohio and transplanted to Key West in 1991. Her theatre photography has appeared in print and posters. Following her love of history and her own genealogy search, she became a www.Findagrave.com volunteer photographer and discovered through photographing these requested graves and monuments the beauty and tranquility of the Key West Cemetery. She is married to author Reef Perkins with family Quincy Perkins, Lena Vasileva and Sienna Perkins. 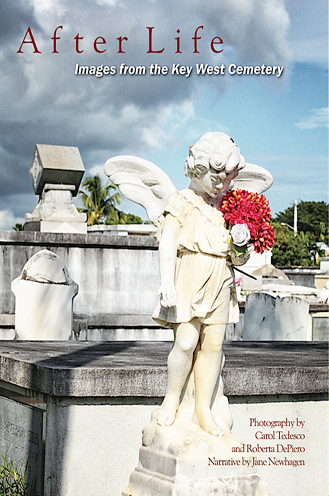 After Life is a sensitively compiled collection of images from the Key West City Cemetery. Some of the subjects are iconic and familiar. Others are hidden in quiet corners or as fleeting as a cloud blowing before the sun. All are memorable. As you reflect on them, you will smile and maybe shed a tear, honoring those who have gone before to make Key West the unique place it has always been – and is today. 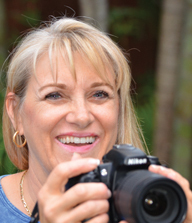 Photographers Carol Tedesco and Roberta DePiero have caught the spirit and shapes of the Key West graveyard from morning dew until sunset and placed the pictures on the pages of this artistic book with remarkable attention to composition, tone, and harmony. The images are gently bound together with a ribbon of prose created by historical novelist Jane Newhagen.